Lake Blaine Cabin befindet sich am Fuße der Rocky Mountains und bietet einen Panoramablick auf die freie Sicht vor Ihren Fenstern. Das Haus befindet sich in günstiger Lage in allen Städten und Dörfern, wo Sie im Montana-Stil einkaufen und zwanglos speisen können. Nach jedem Tag Aktivität, sollten Sie in die Kabine zu kommen unserer ruhigen Umgebung zu entspannen und zu genießen. Sehen Sie sich eine Fülle von Wildtieren an, darunter Adler, Rehe und Truthähne, um nur einige zu nennen. Die Kabinendeck ist nur 50 ft. Aus dem Bach und verfügt über einen eigenen Steg. Grillen, die Feuerstelle im Freien genießen, Kinder können sich auf unserem weitläufigen Spielplatz austoben. Haben wir von jedem Fenster aus einen herrlichen Ausblick erwähnt? Unmittelbarer Zugang zu unserem privaten Hauptanleger und Bootsanleger an einem der begehrtesten Seen von Montana, dem "Lake Blaine". (382 Hektar klares Wasser) 150 m Dock für großartiges Angeln und Bootfahren. Ein angeschlossenes Apartment bietet gegen Aufpreis ein zusätzliches Kingsize-Bett. Das Apartment verfügt über ein geräumiges Wohnzimmer und eine Küche. Bei Interesse bitte anfragen. eine 22-minütige landschaftliche Fahrt entfernt. 700 Meilen Wanderwege für alle Könnerstufen. lange. Tours "Wild Horse" Insel. *** Für internationale Reisende wird eine Bearbeitungsgebühr von 5% erhoben. Diese Eigenschaft wurde mit Lake House Zugang zum See geteilt. Privates Dock und Bootsstart. Der See ist für Wasserski, Kajakfahren, Kanufahren und Angeln. Unsere Bootsanlegestelle und Dock ist ca. 200 m entfernt von der Kabine auf unserem Resort-Grundstück. This is a beautiful place to stay. So peaceful and relaxing. We enjoyed everything about it from the porch to the wildlife! The only thing to be aware of is when you rent it you are not getting the whole cabin. It is divided in half. I did ask before we rented and was told the owners stayed in the other side but would not be there when we scheduled it. They ended up being there part of the time but we’re very nice and quiet. The only reason I questioned this was because the last time I rented a cabin like this a screaming baby was beside us the whole time. Over all we loved the area and it was decorated beautifully!! Thanks for sharing your little piece of heaven with us!! Wonderful place to stay and relax!! 5 days of fun for my wife and I and 4 kids- 3 teens and a 5yo. 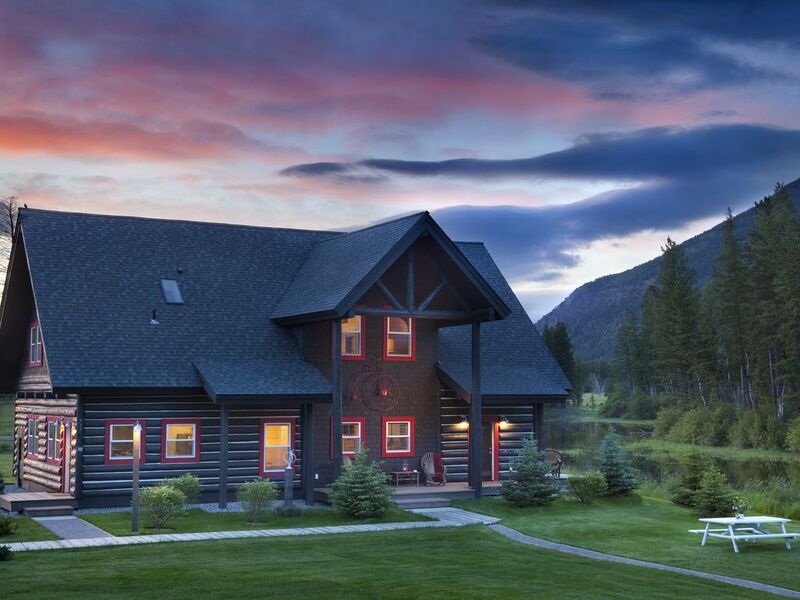 This beautiful and serene property provided a fantastic "home base" for trips to Glacier, Kalispell, and Whitefish. Enjoyed kayaking and paddle boarding on the lake everyday. Also enjoyed sitting on the patio and watching ducks, geese, deer, turkeys, and bald eagles!! While I haven't read it in other reviews, the opportunity for a long bike ride once (or twice) each day was phenomenal. Long quiet stretches of highway go on for miles to the south of the property!! Beautiful Cabin close to Glacier National Park. Clean and well appointed with Heavenly Scenery. We had a great time at the cabin. Clean and well appointed with everything you needed. Close to Glacier Park!! Beautiful scenery for sure. The house was well appointed and suited us well for six adults. We loved sitting out on the creek, watching for the bald eagles and other wildlife. This house is a little piece of paradise. It was very clean and the kitchen was well stocked with pans, dishes, utensils, etc. We definitely appreciated the dual sinks in both bathrooms to help speed along bath time. The only cons were slow internet and spotty cell service, however this just forced us to leave work behind. All in all, we can't wait to come back. We loved our stay at the Lake Blaine house. It's only ten minutes from downtown, yet right up against the mountains and wild Montana. We saw pheasant, deer, wild turkeys, and watched an otter play in the creef just out our window. Only thing that could have been better would have been a vcrackling fire, but the cabin does not have an actual fireplace. We are thrilled that you enjoyed the home and the property. It's a great location for viewing Montana wildlife with the convenience of being close to town. I would like to mention for our future guest that the home does have a gas fireplace. Wir sind zentral für alle Aktivitäten im Tal. Wir sitzen an einem schönen klaren See mit unseren eigenen Anleger und Bootsanleger. Haupteingang Glacier Park ist 22 Meilen von unserem Resort. Wir bieten Ihnen einen ruhigen Ort, um nach dem Genuss der Tagereisen entspannen. Sorgfältig gepflegt Resort. 40.000 sq. Feet Gesamt von üppigen Rasenfläche für alle Arten von Veranstaltungen. Spiele, und Familientreffen. Wir können bis zu 16 nächtlichen Gäste. plus ein extra Kind in einer Krippe.